This simple no nonsense approach to business development and practical advice regarding customer service provides a recipe for success for any business regardless of size. What do we have to do to be more successful? How do we attract new customers and clients? How do we work more effectively with the customers or clients we already have? How do we generate more profit? By the time you have read and digested the 650+ tips, tools, techniques and strategic questions in this book you will have the answers to all of these questions. You will also know what to do to get bigger and better results. Just one question to ask, where was this book 30 years ago when I set out for the first time with my reporter’s notebook? Professor Ian Cooper’s witty hints and tips can be appreciated even by readers like me who make their living by asking questions. He’s recognised that most people, from professionals to fellow passengers on a bus, are more than willing to tackle any query if the approach is right. Do you know what holds you back more than anything else? Professor Ian Cooper believes the answer is simple: we are all held back by our failure to ask for what we want. He believes that by asking the right questions of others and ourselves we can all achieve personal and professional success. Revealing the golden rules of asking. Demonstrating how particular types of questions can be used in varied situations. Encouraging us to consider a whole range of personal thought questions, which focus on particular issues to enhance the quality of our lives and improve our personal performance. Relevant to both your personal and professional life, Professor Ian Cooper will assist you in understanding the power of positive questioning and help you to get what you want when you want it. 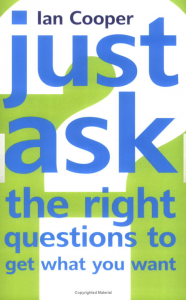 By the end of the book you will have subconciously absorbed the ‘Just Ask’ mindset allowing you to know how to ask the right questions to get the best outcomes. Develop conversation, assertiveness and business skills as you are guided through a series of ‘real life’ examples to help you to apply the techiques you learn to your own life and situations. If you could save just 24 minutes a day you′d gain an extra 6 days a year. Some say the world was created in 6 days. What could you achieve? You don′t have to work harder or spend hours defining your life goals in order to manage your time. The Time Master approach is full of quick painkilling solutions and long–term ′know–how′. This is more than time management, this is time mastery. Forget about complicated planning techniques and endless charts – with over 400 practical tips and tricks at your fingertips, you′ll be able to tackle your main problem areas and take back control of your time and your life, quickly. As a Time Master, you will learn how to slow down and enjoy doing the things you really want to do. This book is a must read for anyone wanting to get more organised. 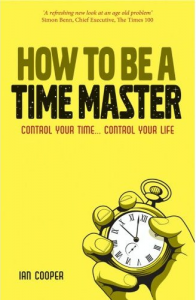 There are tips here for beginners as well as those well on the way to being a time-master. This book is great as it offers practical steps which are achievable. Some real improvements can be made with just a small step. It starts with a questionnaire to gauge where your problem areas are. This is helpful as it narrows down the problem areas you have and helps you realise that you aren’t just one big unorganised mess, but only have a few problem areas to hone in on. Further chapters deal with specific problems. Whilst all chapters offer great practical advice you don’t have to plough through the whole book if you don’t want to, just use the chapters you need. I have put into practice some of the tips and feel far more in control of things now. Small steps really can make a big difference to the quality of your life! I really do recommend this book.